We make the task of choosing affordable house plans a lot easier by showing you the house plans in 3D. Being able to see what the floor plan will look like can really help you in the decision process. 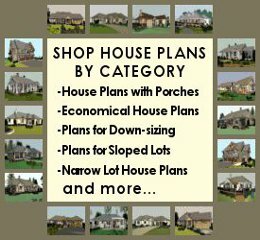 These color images show what each plan will look like when the house is built. All of our floor plans have corresponding 3d views for almost every room. All exterior views of our affordable home plans are shown as well. Complete with landscaping, furnishings and interior décor, these beautiful virtual images of our house plans in 3d are an indispensible feature for selecting the right affordable house plan. Visualizing two-dimensional floor plans can be daunting and after a while all the plans look alike. 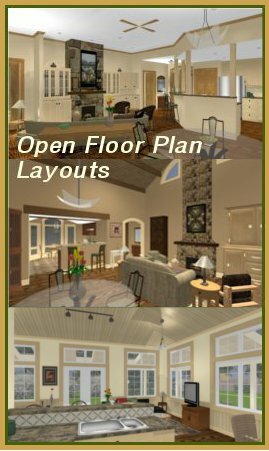 To help you in visualizing house plan drawings, we invite you to scroll through our 3D views for any of our plans and picture yourself living in the home. 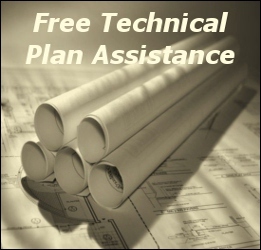 When you need to find the right affordable house plan, one that is best for you, why not make it an enjoyable experience with the convenience of all house plans in 3d. With our blend of design experience and construction expertise we are able to provide homeowners with well-designed, comfortable floor plans at realistic prices. Our house plan views in 3d help you, as the future homeowner, to visualize the aesthetic qualities of the home plan and, in addition, our economical detailed construction drawings make your affordable dream home possible. 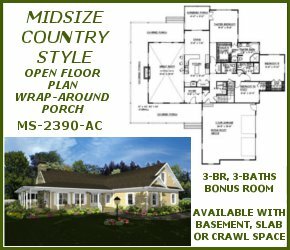 Our efficient small house plans focus on the best and most creative use of floor space, layout and design. These small floor plans live larger than their actual square footage by making very good utilization of space. With features in our plans that allow for convenient transitioning to outdoor spaces (porches, decks, patios) our plans provide a more open, spacious feel. In addition, these small home plans are designed according to the economical grid system layout for true cost-saving affordable construction.